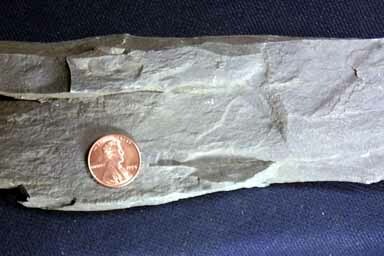 Fine grained rock composed of lithified clay making the rock shale. Pure clays (such as kaolinite) tend to be white or tan, although varying amounts of other components are usually present. Other components may be iron oxides or organic matter. The dark color of this specimen respresents the presence of incompletely decayed organic matter (humus) making the rock dark gray (the rock looks light colored because of the way light is reflected; the detail picture shows its true coloration). Shales normally have a fine lamination structure. This image is looking at the side of the rock, and you will note no layering or laminations visible. Technically that makes this a mudstone. Mudstone is made of the same stuff as shale, but it has been distrupted by something that destroyed the laminations. Often the disruption is caused by bioturbation; organisms burrowing through the sediment and ingesting it to extract food. The dark gray of this specimen indicates a low oxygen environment. From its geologic context we know it was a relatively deep water, quiet, marine basin. See color link for further description.